Press Releases | sidefeed, Inc. Released iPhone App "Remote Live Camera"
TwitCasting was selected as one of the Asia Top 50 Apps. This event was held by e27, a powerful group focused on web innovation. They are located in Singapore and holding many innovative events. Joker Racer on TechCrunch, etc. See more on Japanese media flow. Joker Racer, a real time internet based RC car experience, awarded Gran Prix Prize at WISH 2009. Joker Racer is a project launched at where 2.0 2009, San Jose. Our new beta service will launch on Aug 26 2009. 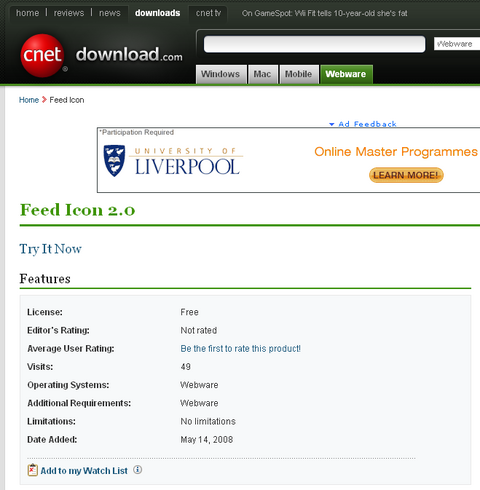 "FeedIcon 2.0" is listed on the CNET download.com. sidefeed releases "Fresh Meeting", Group chat room to boost your creativity. sidefeed releases new version of fast feed reader, "Fresh Reader". Released "Fresh Meeting" - a web-based realtime collaboration tool. Released Personal Bookmark service "toread.cc". Released the mobile version of the "Fresh Reader". Released the first official version of the "Fresh Reader".